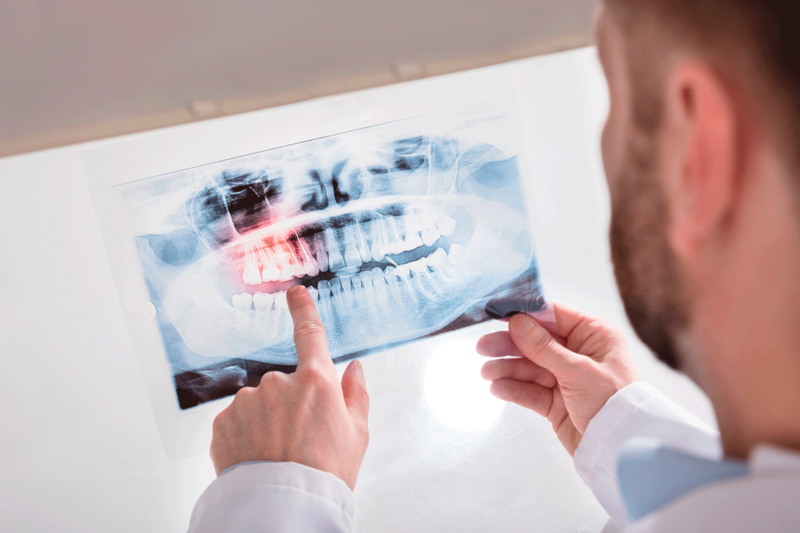 Dental X-rays are crucial diagnostic tools, allowing both our general doctors and advanced specialists here at Dental Health Centers to gain a thorough understanding of your oral health that cannot be achieved through a mere visual exam. Without the information they provide, problematic areas that exist under the surface of your smile can linger undetected and gradually worsen over time. That is why the capturing and consistent updating of these images is such a crucial part of your routine examinations. Our three office locations in Pembroke Pines, FL and Miami Lakes and Coral Gables, have invested in state-of-the-art digital technology for precise X-rays that promote safety, convenience, and reduced radiation exposure. Contact us today to schedule your initial consultation. What could my dental X-Rays Reveal? Potential concerns that exist inside the tooth’s structure or hidden underneath the gum line. Dental caries that is located between your teeth. Teeth and/or roots that are positioned improperly. Tumors that are both cancerous and non-cancerous in nature. Why are digital X-rays superior to traditional film? The reduced waste makes them more beneficial for the environment. The images can be viewed in seconds instead of having to undergo development initially, saving the patient valuable time. No potentially hazardous chemicals are utilized at any point. The images can be modified, expanded, and color-coded in order to bolster a patient’s education regarding their diagnosis and treatment. Appointments are shorter and more comfortable overall. Everyone is exposed to a small amount of radiation in the environment as they go about their regular lives. Generally, the amount of radiation you will receive from a full set of oral X-rays is equal to the amount of radiation you are exposed to naturally in a single day, so they are considered safe in that regard. Our staff members take additional precautions to ensure that the patient does not receive any more exposure to radiation than what is absolutely necessary, including the use of lead apron shields to protect the the body. How often should I have new dental X-rays taken? Your personal oral health needs will help us determine when new X-rays are necessary. During your first visit, our team will capture a full series or Panorex, which is typically sufficient for anywhere from three to five years. Bite-wing X-rays (X-rays that feature your rows of teeth biting together) are typically recommended at least once a year so that we can locate areas of decay or physical damage early on in their development.